An AARP study found that nearly 90% of seniors want to stay in their homes as they get older, known as aging in place. Of course, it’s not as simple as it sounds. With physical health inevitably declining as we age, the barriers to staying independent broaden. Thankfully, there are solutions that can help you or your loved one stay at home and remain independent for longer. Stairs are one of the most treacherous and difficult to navigate areas of the home, and so a stairlift can be an excellent addition for many people with mobility issues. In this post, we guide you through the process of buying a stairlift. We’ll cover how to decide whether a stairlift is right for you, including answering many of the pressing questions you might have. We’ll also explain the factors you should consider when purchasing a stairlift and offer some tips for using your stairlift safely. Is a Stairlift Right For You? What Are My Current and Future Mobility Needs? Is My House Suitable for a Stairlift? What Are the Costs Involved In Buying a Stairlift? What’s Involved In a Stairlift Purchase? How Is a Stairlift Installed? Let’s take a look at answering each of these questions in turn. Unfortunately, an alarming one in four US adults, aged 65 and over, suffers a fall each year. What’s more, falls are the leading cause of fatal injuries in older Americans, according to the Centers for Disease Control and Prevention. If your physical health is declining, this will likely put you at higher risk of falls, even around the home. Stairs, in particular, can pose a big risk to anyone with mobility problems. Aside from fall risk, there may also be the issue that you simply can’t navigate stairs. Some people are able to walk on flat surfaces with little assistance, while using stairs poses a big problem. Similarly, some mobility solutions, such as canes and walkers are ideal for use on flat surfaces but are less suitable for use on stairs. If you’ve decided to age-in-place, then you’ll also need to consider your future mobility needs. 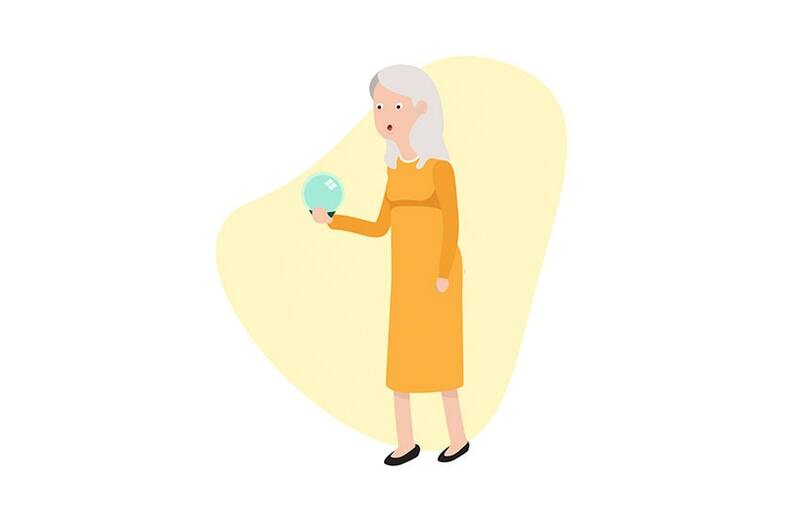 While nobody has a crystal ball, doctors can often tell you how mobility issues will progress over time. As such, you can try to prepare for what the future may hold. Depending on your individual situation, you may need to make one or more modifications to your home to help you stay there and maintain your independence. There are a wide range of home mobility solutions available, a stairlift being one part of the puzzle. Since a stairlift runs on a track fitted to your staircase, the seat can be parked at the top or bottom of the stairs and controls can typically be used to “call” or “send” it either way. One major concern that buyers may have is that they have a set of stairs that is curved or has a landing. Not to worry; there are straight and curved lifts available, so curved staircases shouldn’t present an issue. Another main concern is space. As mentioned, the chair can be parked at the top or bottom of the stairs, but it can also be parked around a corner if that works better within the space. Most stairlifts fold away compactly when not in use, so it should be no issue for others to get around it. However, the staircase does need to be wide enough to house the chair and someone sitting on it (at least 30 inches), but unless you have extremely narrow stairs, this shouldn’t be an issue. What about a staircase that doesn’t have a wall? Not to worry; the stairlift rail is attached to the treads of the stairs, so can be installed on open staircases or on stairs that have a railing on both sides. Of course, cost is always going to be front of mind with a major purchase like a stairlift. Prices will vary depending on your chosen provider and your individual needs, but the below can serve as a very rough guide of what you might be looking at. Basic models of straight stairlifts including installation typically cost between $2,500 to $5,000. The length of the rail and additional features will be the main factors in the price differentials. Curved stairlifts will likely cost between $8,000 to $13,000. In this case, aside from the length of the rail and additional features, the number of curves will also factor in the price. You might be wondering why curved lifts are so much more expensive than straight ones. Well, there are several reasons for this. For one, they work differently, including requiring two motors instead of one, the second one being in place to adjust the level of the seat. This also requires sensors to detect when the slope changes. Plus, these lifts have to be customized, with rail sections being bent to exactly fit the curve and slopes of each staircase. In-home assessments are typically free, and financing options for the purchase price are often available. Quoted prices will usually include installation and a warranty, although the exact terms will be supplier-dependent. You may be able to waive the sales tax if you have a prescription from a medical professional stating that the stairlift is a necessity. A stairlift is definitely not your average everyday purchase and is something you’re likely only going to buy once. As such, unless you know someone who has recently had a stairlift installed, you’re unlikely to be familiar with the whole process. So how does it all happen? 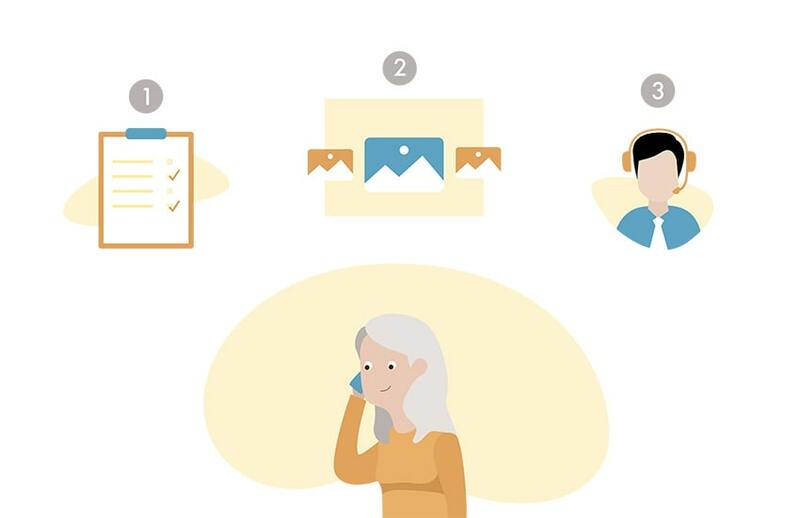 Assessment: You can request an online quote by filling out a form, or you can call to set up a free in-home assessment. Our team will help you to decide on a practical solution that fits within your budget. Design: The design component can be a fun part of the process. We use an advanced augmented reality app, so you can see how your stairlift will look in your home. Installation: After the design is approved, a time can be arranged for technicians to install your stairlift. It really is as simple as 1-2-3, and you’re ready to lead a more independent lifestyle. Some buyers worry that the lift will be installed on the wall of their stairs and that their wall may not be able to support it. However, the rails are actually attached to the treads of the stairs by legs that are spaced about a meter apart. The legs are attached to the stairs using screws. That means that a stairlift doesn’t need to be installed alongside a wall and could be installed along a railing or even in cases where there is no railing. The placing of the staircase will be determined during your consultation, and one side may be preferable over the other. For example, if you want to park the lift around a corner, then the desired “parking spot” will determine which side the lift goes on. Other considerations for placement will include the location or doorways and walkways, and any obstructions that may make it difficult for the user to get on and off the seat. Many people worry about the potential decline in the value of their home after a stairlift has been installed. Removing a stairlift will leave holes in the stairs from the screws, or damage the carpet if there is one. So you may need to consider the cost of fixing this before putting the home up for sale. However, with an aging population, leaving the stairlift in place could actually increase the number of buyers interested in a home. Some buyers may wonder if self-installation is an option. However, this is not recommended. 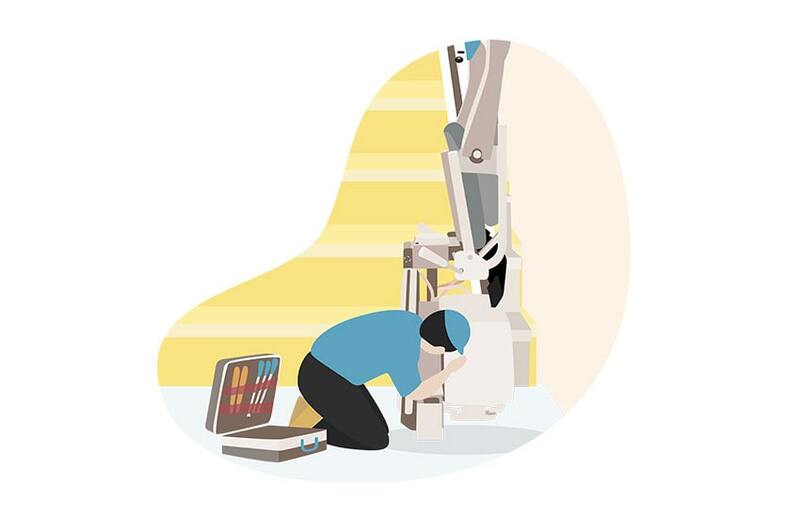 The technicians installing our stairlifts are factory-trained to ensure your safety. Plus, you won’t have to deal with future expenses resulting from incorrect installation. Once you’ve decided that buying a stairlift is the right option for you, it’s time to start shopping. We’ve already mentioned some of the options you have, so as you can see, there are quite a few decisions to make. Thankfully, we’ve put together a step-by-step guide to ensure choosing the right stairlift is plain-sailing. We’ll outline the steps before delving into each in more detail. Make sure the space is suitable to house a stairlift. Decide on a reputable stairlift company and arrange a consultation. 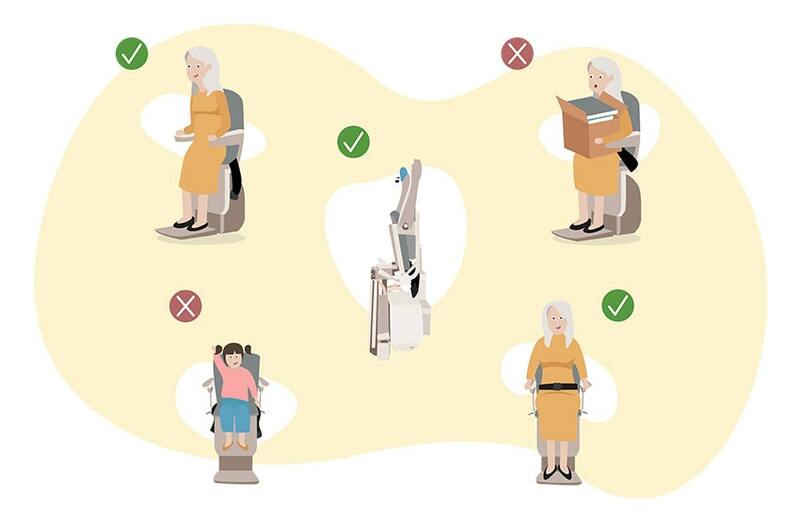 Figure out what type of stairlift you’ll need. Decide on the features you want. Choose a stairlift that will fit. Before finalizing the purchase, double check the warranty and service policy. Now, let’s look at each of these steps in detail. 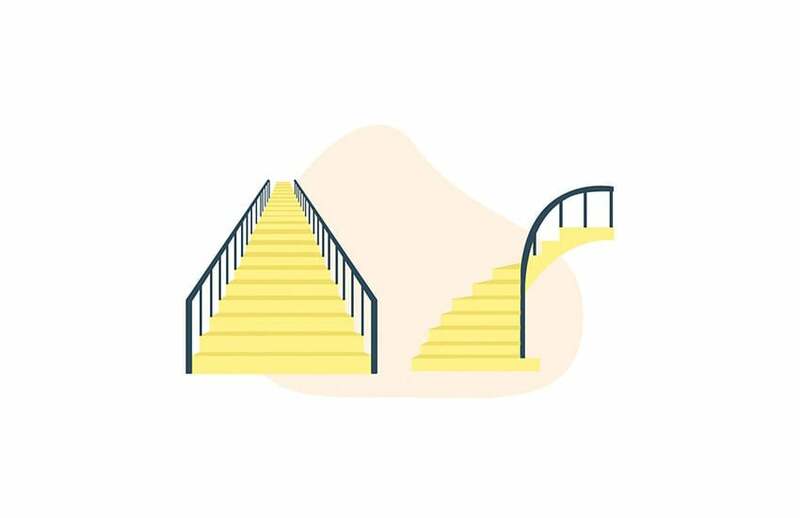 The wall isn’t strong enough to hold a stairlift: This is a non-issue as the stairlift rail will be fitted to the tread of the stairs. My staircase doesn’t have any walls: Since the stairlift is fitted to the stairs, no walls are needed. Lifts can be fitted alongside railings or even on completely open staircases. My stairs are curved or have a landing: This is where curved stairlifts come in. They can be customized to suit virtually any type of staircase. There won’t be enough room for others to get around a stairlift: There are compact stairlifts available, such as the 950 Stairlift. Plus, most lifts come with space-saving features, so that they don’t take up a lot of space while not in use. The seat itself will fold up, and some come with the option of a flip-up rail. While many concerns can be overcome, there are some cases in which a stairlift won’t work. For example, if the stairs are too narrow for someone to fit comfortably on a lift, or if there is not enough space for the user to get on and off the chair, due to a doorway or other obstruction. In that case, you may have to look at other solutions such as the installation of a home elevator. Undoubtedly, during your research of stairlifts, you’ve already come across a plethora of companies. However, they’re not all cut from the same cloth. 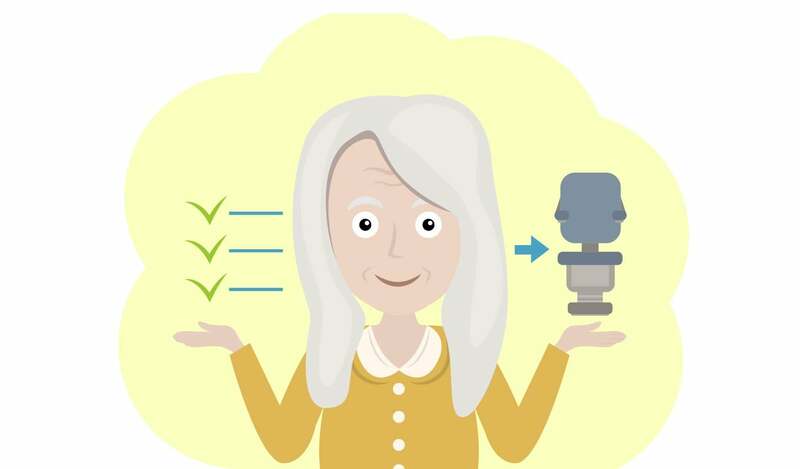 Differentiating factors include the quality of stairlifts they supply, the level of customer service they provide, and the warranty and service policies they offer. Of course, the type of stairlift you want to purchase will depend on your individual needs and budget. But when it comes to customer service, everyone wants and deserves the best. One of the best ways to judge a provider is to check out testimonials and reviews from past customers. These can be found on the provider websites or on independent sites like ConsumerAffairs and HomeAdvisor. In most cases, deciding between a straight or curved stairlift is fairly straightforward. A straight stairlift generally has one use case: a single set of straight stairs. In most other cases, for example, a completely curved set of stairs or a staircase with a landing, you’ll probably need a curved lift. However, there are some exceptions in both cases. For two (or more) straight sets of stairs with a landing in between, you could go for multiple straight lifts. However, this would mean having two separate units so isn’t ideal in terms of safety, practicality, or price. In contrast, you may have a completely straight set of stairs but would like to park the unit around a corner at the top or bottom of the stairs. In this case, the rail will have to bend, so you’ll need a curved lift. Let’s not forget about outdoor stairlifts. Not all stairlifts are exclusively for indoor use, and some, such as the 1000XXL Stairlift, are rugged enough to be installed on an outside set of steps. One area we haven’t discussed in detail yet is stairlift features. Some lifts come with certain functionalities and optional add-ons that others don’t. Multiple charging points: Charging points are where your stairlift battery is charged, usually at the top and bottom of the stairs, so the lift can be charged while parked. Continuous charging function: Some rails are fitted with a continuous charging system so that the lift will be charged no matter where it is parked along the rail. Fold-up seats, footrests, and armrests: These help to ensure the seat doesn’t represent an obstacle or hazard when not in use. Safety sensors: Sensors detect obstacles in the lift’s path and signal the stairlift to stop. Retractable seat belt: All lifts come with a seat belt as standard. A retractable belt is easy-to-use and is more aesthetically pleasing than a loose belt. Harness: A harness will give additional support in cases where a seat belt doesn’t offer enough. Flip-up rail: Stairlift rails have to extend beyond the last step of your staircase to ensure the chair will transport the user safely to the top or bottom of the stairs. The last section of rail can be made to be foldable so that it can be stowed out of the way and not become a potential hazard. Remote controls: These enable you to “call” and “send” the lift where needed. Key switch: A key switch will help you prevent unauthorized use of the lift (such as by young children). Manual emergency stop: This is a button which can be pushed if you need to stop the lift for some reason. Battery backup: A battery backup will ensure your stairlift still works if there’s a power outage. Swivel seat: This will make transfer onto and off the lift easier and safer. Adjustable seat height: Having an adjustable seat height is ideal if you have multiple users. You’ll notice that most features involve making the stairlift more practical and safe for users and others who will be in the home. There are sometimes some aesthetic options too, such as the ability to choose your upholstery to suit the style of your home. When it comes to finding a stairlift that’s right for your body, of course, there’s no one size fits all. Every lift will have specifications including weight capacity and seat width. Not paying attention to these could lead you to selecting a unit that is uncomfortable and unsafe. If you don’t know your current weight, weigh yourself or have your doctor help you. Measure the space needed to sit comfortably by sitting on a chair and measuring your seated lap width. Try out stairlifts at a showroom. Find a model with adjustable armrests if you think it would help. Bear in mind; you want the stairlift to fit you for a long time, so consider the possibility of weight gain and other changes down the road. With all of the excitement of designing your stairlift and choosing additional features, it’s easy to lose sight of how important a purchase this is. Stairlifts are meant to be a one-time deal, so warranty and service policies are a huge factor in the transaction. Before you complete the purchase, you should double check that nothing has changed from the initial consultation. Some providers will offer a different warranty depending on the type of lift purchased. So say, for example, you’ve changed your mind and gone with a curved instead of a straight lift, you could find yourself with a shorter warranty period. Most warranties extend to one or two years, and this should include annual servicing, including covering the cost of any required repairs. After the warranty period, it will be up to you to pay for servicing, repairs, or replacements. Some companies offer an extended warranty, often up to five years, for an additional fee. Once you’ve purchased your lift and gone through the installation process, it’s time to put it to good use and enjoy your new-found independence. However, before you do, it’s worth bearing in mind some key safety tips to ensure a safe trip up and down the stairs. We discussed some built-in safety features earlier, but it’s also important to use your new unit correctly. When your stairlift is installed, your technician will go over its safe use with you, but it’s worth having a good handle on things beforehand. Wear your seatbelt. Granted, you’re not reaching great speeds on a stairlift, but wearing a seatbelt or harness is still very important. Just a slight loss of balance could result in a dangerous fall. Take care when getting on and off the lift. This may seem obvious, but just like with many everyday activities, it’s easy to get into bad habits. Getting off a lift, especially at the top of the stairs can be quite dangerous, especially for someone with compromised balance. Consider taking advantage of features such as an extended rail or a swivel seat to mitigate these risks. Don’t overload the unit. It might be tempting to try to carry objects (or people) with you on the stairlift. However, not only will this represent a hazard, you could end up overloading the unit by putting too much weight on it. Ensure kids can’t operate the lift. If you’ll have young children in the home often, it’s a good idea to get a key that can disable the operation of the lift when not in use by the user. Fold up your chair when not in use. Most chairs come with fold up seats, armrests, and footrests. Aside from making it easier to get around, it also makes things safer as you don’t have large tripping hazards. This is especially important if there are small kids, others with mobility issues, or anyone with a sight impairment. A lot of this comes down to common sense, but it’s worth being aware of the dangers and letting others know too. Buying a stairlift can be both overwhelming and exciting. There are so many options to consider, but the prospect of your new-found independence is something to behold. Thankfully, in this guide, we’ve provided you with answers to countless questions you may have, to make the whole process a lot simpler. All that’s left is for you to set up a consultation and start designing your perfect stairlift.